JONESBOROUGH, Tenn. — The National Storytelling Network (www.storynet.org) recently announced that Brenda Wong Aoki of San Francisco is a recipient of the Oracle Circle of Excellence Award. This award is presented to artists who are recognized nationally by their peers to be master storytellers who set the standards for excellence and have demonstrated, over a significant period of time, a commitment and dedication to the art of storytelling. In its 41-year history the National Storytelling Festival has featured only six Asian American storytellers. Aoki was the first of these, appearing four times in the last 26. She has deep roots in San Francisco, where she has been based for three decades. Her ghost story “Black Hair” – an early signature piece adapted from one of the oldest collections of Japanese mythology – was published in “Best-Loved Stories Told at the National Storytelling Festival” (Little Rock: August House, 1991). Her rigor as an artist, and the excellence of her eclectic repertoire – based on subjects ranging from Asian teenage gang warfare in the streets of Los Angeles, Japanese legends and ghost stories, the internment of Japanese Americans during World War II, women’s obsession over aging, the impact of miscegenation laws on her paternal grandfather’s family at the turn of the 20th century, and environmental issues (the focus of her latest work, “Mu”) – are undisputable. 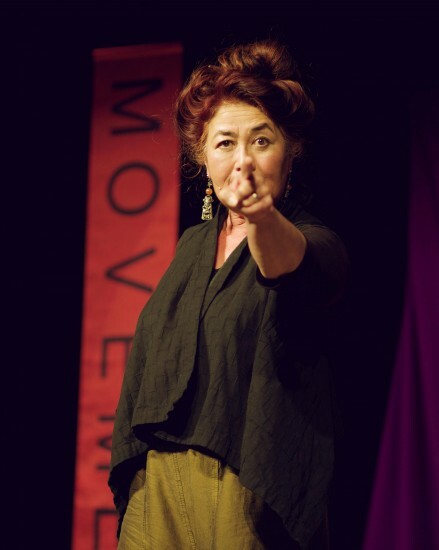 As a multiethnic teller whose work often engages complex and political subject matter, she has pioneered theatrical storytelling not only on the stage of the National Storytelling Festival, but also at the Japan America Theatre (Los Angeles), the Kennedy Center (Washington, D.C.), At the Foot of the Mountain Theatre (Minneapolis), the New Victory Theatre on Broadway, the Dallas Theatre Center, Tsukuba World Expo (Japan), the Adelaide International Festival in Australia, the Graz Festival in Austria, and the Esplanade in Singapore. In collaboration with her husband, jazz composer Mark Izu, Aoki has released three musically underscored spoken-word audio recordings: “Tales of the Pacific Rim: Dreams and Illusions” (1990) and “The Queen’s Garden” (1996) – both INDIE award winners – and “Legend of the Morning Glory” (2009). In addition, she provided the spoken-word narrative on Izu’s multidisciplinary recorded work, “Last Dance” (1998). She also published “Mermaid Meat – The Secret to Immortality and Other Japanese Ghost Stories” (San Francisco; Belly to Belly, 2007), a print collection of tales (plus a CD recording) sumptuously illustrated with woodblock prints by the 19th century Japanese artist Yoshitoshi. World Arts West, the U.S./Japan Friendship Commission at Friend Center for the Arts, and the Hong Kong Cultural Center have commissioned Aoki to create performance pieces. She is the recipient of three National Endowment for the Arts solo performance grants and a Rockefeller fellowship. Aoki was recently commissioned by the State of California to create a site-specific storytelling performance work with music and dance about the history of San Francisco Japantown. In addition, Aoki and her husband will premiere a storytelling suite for chamber ensemble with the Orchestre Symphonie de Montréal in 2015. Aoki will receive her award at the National Storytelling Awards Ceremony on Saturday, July 26, at the Hilton Phoenix/Mesa hotel in Mesa, Ariz. For more information about Aoki, visit www.brendawongaoki.com.